Aidah is an ethical, eco-chic fashion line that unites urban flair with coastal cool in timeless style. The collection features unique, comfortable designs that fit by wrapping or tying, in versatile looks for brunch, business and soiree. Each garment is handmade in rich, nature-inspired hues and distinctly brushed with Aidah’s signature golden emblem.Aidah’s ethical green mission is to empower women and protect the environment through versatile, eco-friendly designs and the support of charitable organizations. Since launching in 2008, Aidah has become one of the most buzzed up and coming fashion lines. The stunning label has become synonymous with luxurious, unique style and has graced runways from coast to coast. It is a red carpet choice of actress Gabrielle Union and has garnered notable press, including Essence Magazine, JET Magazine, The CW Network, Fox News, NBC and the Washington Post. The collection includes women’s brunch, business and cocktail attire, evening gowns, maternity, accessories and leisurewear for men. Last Chance for the Kathy Dress! 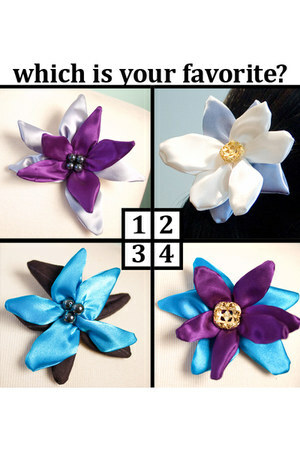 Which color brooch is your favorite?